Before we start, this isn’t a fanboy of a rival console laying into Sony in an attempt to rustle some jimmies. I’m a huge fan of my Playstation 4 after switching from primarily being a 360 gamer last gen, and the Sony brand has always held a place in my heart. Hell, I was one of the 16 people absolutely convinced that Mini-disc was the future. If your Playstation account is compromised, you are completely fucked. The most recent example of this the current top post in the r/gaming subreddit. A user by the name of kadjar started receiving emails notifying him of purchases being placed on his account, totalling $600. 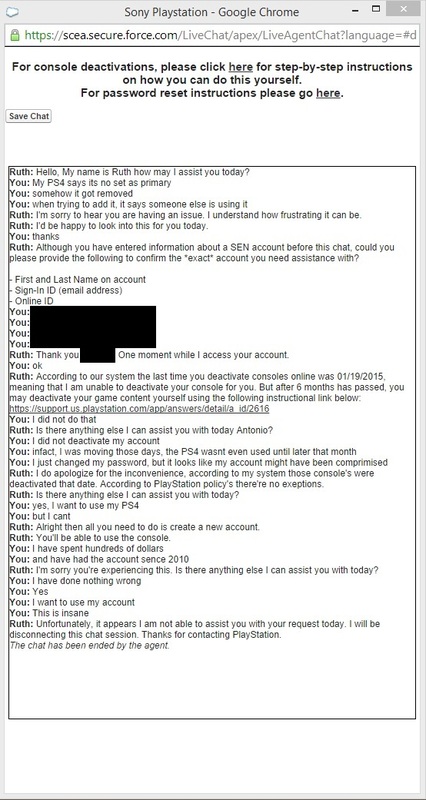 After discussing this with Sony, he was given two painful options to choose from; he could have a refund from Sony, but only to a maximum of $150, leaving him $450 out of pocket, or he could raise a dispute with the bank to recover all the money, however in doing so Sony will permanently ban his account and in the process lose access to his entire digital library. Furthermore, the ‘hacker’ had deactivated kadjar’s PS4 from the network and moved the account to a different PS4. Despite now regaining access to his account, kadjar is unable to activate it on his own PS4 due to Sony’s completely arbitrary policy to only allow one activation per 6 months. In summary, kadjar is now unable to use his account for 6 months, and faces the choice between losing $450 or losing access to his account, and all the digital purchases that go along with it. Why? Because this is Sony’s policy. Don’t be mistaken in thinking that this is a one off case. In recent months I’m seeing more and more cases of similar things happening, with the end result always being dreadful customer support from Sony. If it’s not more cases where customers are having fraudulent charges put on their account, such as this $570 here, it’s cases where PS4’s have been mysteriously removed as the primary console and customer support point blank refuse to help. Yet again, this is Sony’s policy. In each of these cases, Sony’s support representatives seem to have their hands tied by policies that are not there to protect the customer, but instead to protect Sony. If it’s not policy, it’s incompetency. 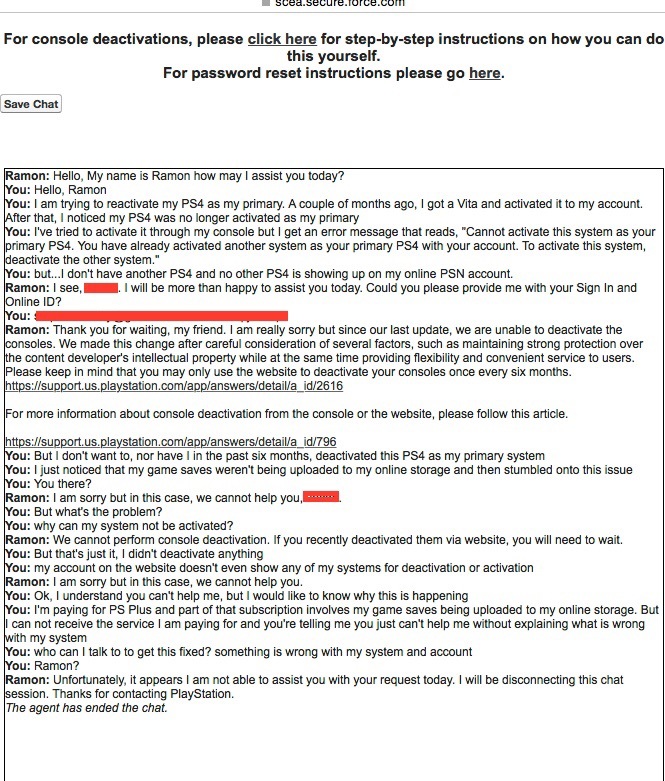 A friend of mine had several months of PS+ vanish from his account, yet Playstation customer support did absolutely nothing to help him resolve the matter. After several weeks of emails, hours on the phone, non-existent calls back from managers and tweets back and forth, Dan eventually gave up. I think it’s prudent for everyone to take this opportunity to ensure you online accounts are a secure as possible. Use a unique password. Beware of phishing attempts. More importantly, remove your credit card information from PSN. Personally, I don’t have my card info saved on PSN, Xbox Live, Steam, or any similar services, all purchases I make are via top up cards. More importantly, it’s time to stop buying digital until Sony changes their policies in these matters. The choice given to kadjar above is absolutely repugnant; either way he is losing out on hundreds of dollars of his hard earned money. Imagine that happening to you. If you bought disc at least you have the opportunity to create a new account and continue playing the games that you bought. Playstation users can shrug off the jibes about PSN outages, exclusives, and whatever other criticism gets thrown around by users of other platforms as they strive to justify their own expensive toy, but this complete lack of customer support is a significant problem that could affect any one of us, and should not be swept under the carpet. Sony, before the launch of the PS4 you said you were #4theplayers. Now is the time to prove it. Note; we reached out to Sony for comment regarding this article, however we are yet to receive a response. We will update the article as and when we do. This entry was posted on Friday, March 13th, 2015 at 10:25 and is filed under News. You can follow any responses to this entry through the RSS 2.0 feed. You can skip to the end and leave a response. Pinging is currently not allowed.